Excerpts from interviews with Forest Service chiefs whose tenures span fifty years. It was a half-century of rapid change and increasing controversy, marked by words that still clang with contention: wilderness, civil rights, public participation, clearcutting, ecosystem management, spotted owl, environmentalist, timber salvage. 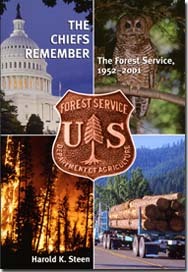 Forest History Society, 2005. 156 pp. Ill., index.